House was born on August 10, 1926, in Glovertown, Newfoundland. He was educated in Glovertown and, in 1943, went on to study at Memorial University College in St. John's. He then started medical school at Dalhousie University and completed his degree in 1952. He practised medicine in Baie Verte, Newfoundland from 1952 to 1954. House subsequently furthered his medical training, specializing in neurology, at the Montreal Neurological Institute. He completed his training as a neurologist in 1959 and returned to practice in St. John's as the only neurologist in the province until 1966. He did additional post-graduate training in London in 1965. House helped establish Memorial University's medical school. He spent 30 years there as a neurology professor and held several administrative appointments. From 1966-1974, House was Chief of Staff at the General Hospital in St. John's. In 1975, he started the Telemedicine programme at Memorial University. He continued as a medical academic and practising neurologist until his retirement from the full-time university faculty in 1993. He remained with the university, however, as the president's consultant and advisor while continuing his research in telemedicine. House's consulting position with the president ended in 1997. On February 5 of that year he was appointed as the tenth lieutenant governor of Newfoundland and Labrador. 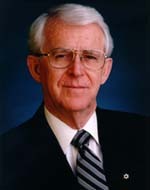 During his career, House has received several awards including the Order of Canada in 1989, the Atlantic Canada Innovator of the Year Award in 1990, and the Canadian Medical Association's 1997 Medal of Service.